Thinking about where to get free pallets to start a home project? Scrap pallet recovery can range from small quantity pickups to full truckload retrieval. 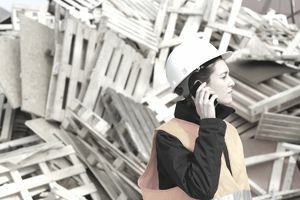 Scrap pallets, commonly known as pallet “cores” in the recycling business, can be found in a great variety of places where pallets are emptied, or where they are disposed. If you are looking for a modest supply of pallets on a steady basis, an important rule of thumb is to "think small." Craigslist.org or other online or print ads offering free pallet removal. Schools can generate ongoing small quantities of pallets that were used to ship copy paper, books and other supplies that may accumulate behind the school, or be collected and aggregated at the school district works yard. Small businesses and gas stations can generate small quantities of pallets. Focus on ones that generate the type of pallets that meet your needs. Watch for pallets such as soft drink or dairy products units that may be part of a reusable pallet program. Others, such as pallets used to ship seasonal items such as salt or fire logs are more likely to be considered a one-way shipment and therefore, better candidates to be available. Fresh produce markets can generate healthy quantities of empty pallets, and sometimes these are available, especially if they build up too many. Fresh produce markets may have agreements with their suppliers in regard to returning them, but it is worth asking about pallet availability. Pallet Recycling companies sometimes sell wood material or pallets to pallet craftspeople at modest rates, especially ones that do not conform to popular sizes. Call local recyclers to see if this is something they would offer. What's the best bet for free pallets? As mentioned above, you are more likely to get pallets for free from a smaller location that generates pallets in small quantities, or if the pallet sizes are not attractive for resale to other pallet users. Non-standard pallets are more likely to be single-use pallets. Single-use or expendable pallets will likely have bright new wood instead of weathered material associated with pallets that have been used many times. On the other hand, single-use pallets are often made of lower quality lumber, so there are trade-offs involved. Low-quality pallets sometimes are manufactured with fewer nails, or shorter ones which can be more readily removed when taking the pallet apart. It should be cautioned that pallets stored outside of a small business are not necessarily “free for the taking.” The pallet collector should receive permission from the business owner before removing pallets. Another consideration for the pallet collector is that of pallet markings. If the pallet has an ownership stamp on it, such as CHEP, PECO, iGPS, Coca-Cola, U.S. Postal Service or others, then these pallets should not be removed. Such companies vigorously enforce the property rights to their pallets, and you may find yourself charged with unlawful possession of them. For picking up smaller pallet quantities, pallet street vendors may use flatbed or pickup trucks, and sometimes utility trailers. Useful additions include tie-down straps or cargo nets. Be sure to practice pallet handling safety. Use gloves to protect hands from slivers, use proper lifting technique, including keeping the pallet close to the torso and back straight. Because pallets can often weigh 60 pounds or more, proper lifting technique should be employed, utilizing the help of other individuals or lift equipment such as forklifts where available. A power or manual pallet jack can help take some of the muscle out of moving pallets at a location. Larger recyclers often purchase pallets from pallet street vendors who accumulate pallets from small businesses. Typically they drop these off at the recycler’s yard, sorting them into appropriate stacks after arrival. Many recycling businesses now take safeguards to prevent any concern about dealing in stolen pallets. As such, they may require a photocopy of the street vendor’s driver’s license, and pay by check. For locations that generate truckload quantities of popular pallet sizes, such as 48x40-inch, then recycling businesses are more likely to compete for the opportunity to purchase the pallet cores. As a result, many large generators of pallet cores have an expectation of being paid for them. You will soon get an idea of what prevailing market prices are for cores in your area, and these vary from region to region, depending upon supply and demand. The Recycle Record is a subscription-based market report that provides regional information about recycled pallet pricing. In addition to price, pallet recyclers may also compete for cores with respect to service. The pallet recycler may be required to drop empty trailers for the business to load as it generates empty pallets, or to provide smaller quantity pickup if the business does not have room or a dock door to facilitate storage of empty pallets inside or on a drop trailer. What's the True Importance of Wood Recycling in C&D Management?